The town of Cortona is easily reachable by train from Rome: a pleasant and affordable 2 1/2 hour train ride ((Euro 16 in first class). 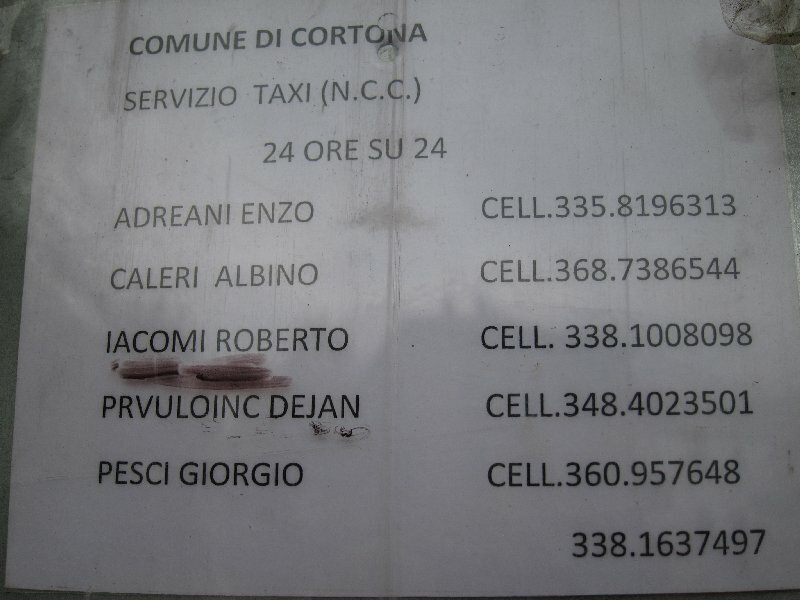 Once you reach the Camucia / Cortona station you can take a bus (runs about every 40 minutes) or a taxi (Euro 10) up to Cortona centro. The entrance way to Cortona is flanked by two enormous wooden doors. Every Saturday morning in the centro storico’s Piazza Signorelli plan to enjoy the outdoor market: cheese, porchetta, fresh produce, local salumi. The market has a nice assortment of handmade tablecloths, inexpensive print tablecloths, brightly colored linens and clothing. as it’s olive season I bought two print tablecloths with an olive motif: perfect to decorate a casual, fall lunch table. Cortona is small (about 2,000 residents in the winter and triple that in the summer months) so it’s easy to explore the whole town on foot in a day….and to enjoy a nice meal and local wines. Cortona is filled with ancient stone walls and doorways, each hinting at a story from the past. I love the juxtaposition of this charming green door with the assortment of winter veggies and herbs for sale, right around the corner from Piazza Signorelli. Piazza Signorelli takes its name from Luca Signorelli, the Italian Renaissance painter. We lunched at the quirkily decorated restaurant Osteria del Teatro. Stairs leading up to the restaurant entrance were laden with flowers. What once was an apartment has been turned into a restaurant with a number of small, cozy dining rooms. Each room is chock full of an eclectic array of decorative items: paintings, bottles, knick-knacks, jars, candles. The oddest room by far was the ladies room: filled with dolls…on the shelves and windowsills, hanging, propped everywhere. So many so that it was hard to find the soap, towels and flushing mechanism among the menagerie. The wines were local: 2010 wines from the Montecchiesi Dal Cero Tenuta. We started off with a chardonnay: Il Bianchino. Our main course was accompanied by a robust Selverello sangiovese. With dessert we had a Vin Santo del Chianti Geografico 2007. Although I’d planned to do more wandering following lunch I opted instead for an earlier train getting me back to Rome at dinner time. After our hearty lunch in Cortona I bowed out of dinner and finished the day touring the Cortona countryside instead.